Manila - In a press briefing on Thursday, August 29 at the New Executive Building, Malacañang Palace, Presidential Spokesperson Edwin Lacierda discuss the chronology of events or the timeline of the surrender of Janet Napoles to President Aquino III at 9:37 pm, August 28. 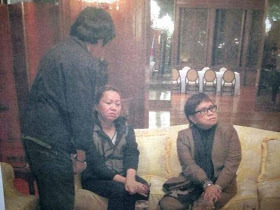 Janet Napoles inside Malacañang. "only high profile fugitives may surrender to the President"
In the morning, when the President announced in his interview there was a ten-million peso (PHP10M) bounty—after that, there was subsequent news that Atty. Lorna Kapunan mentioned on TV, or there was a crawler on ANC, that there was a statement coming from Atty. Kapunan that her client was willing to surrender. I think around 12:37—I don’t recall if I called or Lorna called—but we discussed, I think I called, and I inquired and we discussed and verified: Was your statement that I saw on TV true or not, that her client was willing to surrender? And she said, yes. And she already mentioned at that point that they wanted to surrender but Ms. Janet Napoles was fearing for her life. There were threats on her life. I asked her if her client was willing to surrender. That was at 12:37 p.m. I think we discussed it for around ten minutes. After that, I went to the President. This was after his function at the Apolinario Mabini awards. When he went back to his office. I went up to him and I informed the President about the developments. Around 4:06 in the afternoon, Atty. Kapunan called me back, and she said that her client was willing to surrender to the President. Her only request was that her safety be secured, owing to the fact that, on her part, there was fear or there were threats to her life. Then after that, I went back to the President. When I saw the President, I understand that he already instructed Secretary Mar Roxas. So, when I went to the President, Secretary Mar Roxas was already there, and Executive Secretary Ochoa. I informed them that, according to Atty. Lorna Kapunan, Ms. Janet Napoles was willing to surrender. She was obviously, in my sense, she was not in direct contact with Ms. Napoles. She was talking through a conduit. So, we were going back and forth on where to meet, and at that time when they were still discussing on their end, Secretary Mar Roxas—upon instructions from the President—Secretary Mar Roxas was already preparing the facility and how to secure the person of Ms. Janet Napoles. Secretary Mar Roxas was calling his PNP personnel. I think he also called Chief Alan Purisima and some other police officials. And when it was confirmed that we were pushing through, I did not know what vicinity I was going to. So, upon informing Sec. Mar Roxas, he provided a vehicle for me and also the escorts to secure Ms. Napoles. Because we don’t know exactly what time there was or how long it will take, ang sabi ko, “Manolo, Abi, join me. We’ll have dinner first,” with the idea that if may go signal na from Atty. Kapunan, split na sila, split na kami, they’ll go back to the office. We left this building at around 6:50 [p.m.], and on the way to Pasong Tamo, I got a call from Atty. Kapunan to see her in Whitespace. Apparently, Atty. Kapunan is a trustee of the Red Cross. So, when I reached White Space, I saw Lorna. MALACAÑANG PRESS CORPS: Heritage Park, libingan? SECRETARY LACIERDA: Sementeryo. Gabi ‘yon, hindi ako taga-roon, sorry. Heritage Park, sa loob. We waited there from 8:06 [p.m.] until 9:08 [p.m.]. Kinausap ni Mr. Napoles, may kausap siya, may tine-text siya. So at around 9:08, may dumating na dalawang babae. Tapos, nakita namin ‘yung dalawang babae; we didn’t recognize sino sila. Tapos, tumawag ‘yon outside the car. Sinagot ni Mrs. Napoles. Sila na pala ‘yung dalawang babae na nasa labas ng sasakyan. So, ‘yung isang babae si Mrs.Napoles. ‘Yung isang babae ‘yung kanyang—I don’t know kamag-anak—dala ‘yung mga gamit ni Ms. Napoles. So pagkatapos n’on, dumiretso na kami sa Palasyo, informing the President that we are on our way back. At around 9:08 ‘yon; 9:37 kami nakabalik sa Palasyo. We arrived the Palace at around 9:37. Nagpa-security check sila. Tapos, si Ms. Napoles tinignan po ng duktor. Tapos no’n, nag-usap na sila ni Pangulo. Nandoon si Secretary Almendras, Secretary Mar Roxas, Secretary Carandang, si Executive Secretary Ochoa, si Usec. Valte, Usec Quezon. Nag-usap sila; more or less mga ten minutes yata iyon. So, papunta nang Crame, I was in the car with Ms. Napoles, Mr. Napoles, ‘yung kasama nila, at si Atty. Kapunan. So we went together. The President went ahead na, so nasa convoy kami nila Secretary Mar, Secretary Rene Almendras, Secretary Carandang. So pagdating namin doon, she was brought to the holding area, tapos, the usual booking procedure ginawa doon. The President wanted to make sure that the area was secure, so he went in and inspected the premises, and after that, umalis na rin si Pangulong Aquino. So, iyon po ang nangyari kagabi.